NEW BRITAIN - Not even the cold outside could slow down the New Britain softball team’s hot bats Tuesday afternoon. 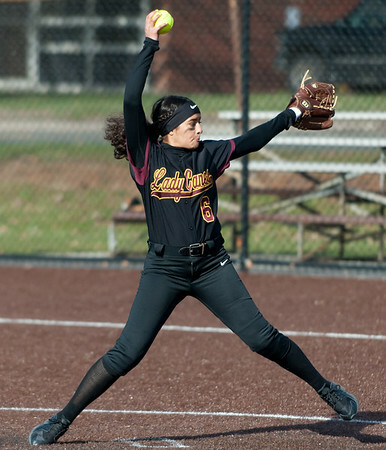 Josleen Rivera hit two home runs and Valentina Hernandez hit a grand slam in her first varsity at-bat as the Hurricanes routed Capital Prep 26-2 in a shortened five-inning game. In total, New Britain (4-1) collected 18 hits with plenty going for extra bases. Amanda Jacobs went 3-for-3 with two doubles, Gabby Roy hit a triple and walked three times and Gianna Gonzalez went 3-for-3 as well with three RBI. Rivera was also dominant from the pitching circle. The sophomore struck out 10 batters and allowed just one hit. Goodwin Tech 18, Vinal Tech 2 (5 innings): Valerie Ramirez proved to be just as dominant in the pitching circle as she was at the plate for the Gladiators. The sophomore tossed a no-hitter over the shortened game and struck out six. She also helped out her own cause, going 3-for-5 with an RBI. Izzi Hancock went 4-for-4 for Goodwin Tech and drove in four 4uns, while Yarlian Moya collected two hits herself and drove in two as well. Bristol Central 7, Berlin 5: The Redcoats outhit the Rams and outscored them early, but had Berlin also committed more errors than Bristol Central. It also didn’t help that the Rams scored the deciding two runs in the top of the sixth. Adam Bilinsky received the loss for Berlin, while Peyton Clark earned the win for Bristol Central. Newington 16, Bristol Eastern 3 (5 innings): The Indians beat the Lancers for the second time this week during a game called at the end of the fifth inning per the mercy rule. Newington’s Leonard Johnson was 2-for-5 with three runs and an RBI double. Joey Zawisza was 2-for-4 with two doubles and four RBI and Mike Sobelewski was 2-for-3 with three runs, three RBI and a triple. Plainville 5, New Britain 2: The Hurricanes might have come away with two points, but the Blue Devils only really lost one individual match. New Britain’s Ali Saleh beat Jeremy Myska to take the win in No. 1 singles. The Hurricanes only other victory came on a forfeit in the No. 4 doubles. Brandon Zheng, Taegan Brochu and Mack Kossuth each earned singles wins, while the tandems of Travis Lavigne/Mike Torres and Jarod Serrano/Jason Demmons picked up doubles victories for Plainville. Newington 6, Berlin 1: The only match the Indians lost was No. 1 singles and swept doubles. Dan Lasoto and Sam Johnson defeated Wesley Cantliffe and Ryan Jenkins 6-4, 3-6, 10-3. Gynno Bacaoco and Josh Ellis defeated Dom Biello and Ryan Cyr 6-0, 6-0; and Shihao Zhai and Lukas Klin defeated Stephen Gendreau and James Zovich 6-2, 6-1. Berlin’s lone win came from Jonathan Trevethan who defeated Sean Davis in set scores of 6-0 and 6-0. The Indians continued its success throughout the duration of the singles matches. Matt Utter defeated Thomas Fijalkowski 6-2, 6-1, Ben Arora defeated Kevin Stafstrom 6-2, 6-4 and David Magsayo defeated Justin Chyra 6-0, 6-0. Southington 7, East Hartford 0: The Blue Knights had a very successful afternoon, sweeping the Hornets. In the singles matches, Abby Murphy defeated Nadia Tamri 6-0, 6-0; Coral Tommervik defeated Jessica Wlochowski 6-0, 6-0; Molly Murphy defeated Sarah Fletcher 6-0, 6-0; and Joelle Stublarec defeated Michelle Zheng 6-0, 6-0. As for doubles, Carolyn Callahan and Chantelle Gimenez defeated Efua Koomson and Sandra Osei-Boasiako 6-1, 6-1; Samantha Barmore and Gianna Wadowski defeated Jemmea Jean-Gilles and Sarah Ghonaim 6-0, 6-0; and Emma Wojcicki and Kate Hardy defeated Kareema Chariwala and Ashley Nguyen 6-0, 6-0. Hall 6, Newington 1: It was 6-0 before Julia Mazur and Lindsay Weaver beat Abi Ciplinski and Rachel Saal 6-0, 6-4 in the final doubles match. “Everyone fought hard and battled a tough team and what felt like winter conditions today,” Newington head coach Sean Hussey said. Wolcott Tech 225, Goodwin Tech 248: The Gladiators are still in search for their first win of the season. Wolcott Tech’s Max Keller was the medalist. Josh Donaghy led Goodwin Tech with a 56. Jackson Collin was next with a 60 and was followed by Farrell Leardi (65) and Brabdon Ketkeorasmy (67). Newington 206, Rocky Hill 206, Bloomfield 286: The Indians tied their first match of the season with Rocky Hill, while beating Bloomfield. Newington’s Bryan Turgeon was the medalist after shooting a 47. Jake Irons was next with a 52 and was followed by John Hurts (53), Cole Pratte (54) and Mike Hamill (56). Maloney 188, Plainville 226: It was not the season opener the Blue Devils had hoped for. The Spartans’ Demetre Carnot was the medalist after shooting a 41 on the Par 35 course. Alan Milson led Plainville with a 53 with Jacob Desthaine (57), Christian Damuio (57) and Logan Manger (59) rounding out the team’s top four. New Britain 84, Bulkeley 21: It wasn’t much of a contest for the Hurricanes who had a number of standout performances along the way. Rosalynn Smith and Jamie Kelly were both double winners for New Britain. Smith won the long and triple jumps, while Kelly took the 800- and 1600-meter dashes. Other notables were Zol Gruillion, who took first in the 300-meter hurdles; Chelsea Anthony, who won the shot put event; and Raven Simmone Jarrett, who took the high jump. Posted in New Britain Herald, Berlin, Goodwin Tech, New Britain, Newington, Plainville, Southington on Tuesday, 17 April 2018 21:37. Updated: Tuesday, 17 April 2018 21:39.